June | 2014 | KC & Co. This past weekend, the American Diabetes Association hosted its 74th Scientific Sessions. Artificial Pancreas technology was the hot topic. Most media attention has focused on researcher Ed Damiano, whose son has T1D, and his “bionic pancreas”. The Bionic Pancreas utilizes both insulin and glucagon to manage glucose levels. But Damiano was not the only presenter talking about AP technology at the Sessions. The UVA AP, like the Damiano project, utilizes the T Slim pump and Dexcom cgm. The reason being that the T Slim is the only pump currently on the market that can handle the advanced algorithms. (however, I believe that Medtronic is developing its own version of an AP, of which the 530G was the first step). The primary difference between Damiano’s Bionic pancreas and the UVA artificial pancreas is the use of glucagon by Damiano. UVA uses mini boluses of insulin which increase or decrease constantly in reaction to the glucose readings. however, due to FDA regulations, the Smartphones have been disabled from phone capabilities. The “brains” of the UVA AP are housed in a Smartphone PDM. Anyone approved by the user,with access to a Smartphone, tablet, or computer could monitor remotely. University of Virginia results. Abstracts presented Sunday includes results from a study of 10 adults, who stayed at a research “home” that is part of the campus. The study’s aim was to fine-tune insulin delivery overnight, essentially “resetting” the patient to near normal glycemic levels. Dr Brown said the technology aimed for an average 7 am reading of 120 mg/dL, and came in with an average of 119.3 mg/dL, compared with 152.9 mg/dL under standard care. And this happened using lower amounts of insulin, 6.1 units compared with 6.8 units under standard care. According to the study, improved glucose control carried over to the next day. All done without glucagon. And as for the teen trials that Kate participated in? I do not have Dr. Danny Chernavvsky’s official results, but they were in line with the adult trials. Low glucose levels were prevented. The race is on…and competition is a good thing. 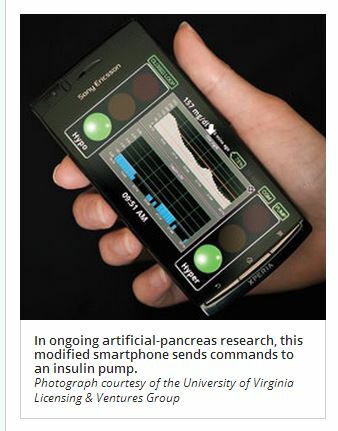 So don’t think Ed Damiano’s bionic pancreas is the only game in town. There is so much more work being done!